An increasing number of flooring contractors are adding an additional revenue stream to their businesses by offering commercial floorcare services to their clients. Besides boosting their revenue, this also enables them to build and maintain valuable relationships with the end users of the flooring products they install. Director of Floorcare for Starnet, Eric Boender, told Floordaily.net that there are a number of advantages of this business model, such as solidifying future product and installation as well as future revenue opportunities. “Compared to five years ago, the revenue opportunity has expanded in the floorcare business with additional services, including stone and marble restoration, concrete and terrazzo polishing, and high-performance coatings for ceramic, concrete, resilient and stone. High performance coatings have been in the market for a while but have been improved so that they are easier to apply and don’t yellow in the long term. In addition, marketplace acceptance of these coatings has increased,” says Eric. Cleaning vs product installation: what turns the most profit? Eric says that floorcare has a higher profit margin than product installation (P/I). “Consistent with the service business, floorcare is a higher margin business than P/I. Margins on P/I run between 10% and 22%, but in a service business like floorcare, margins are more in the 50% range. In addition, P/I business is often catch-as-catch-can, whereas floorcare is consistent. A contractor establishes customers and contracts and then continues to grow on top of that,” says Eric. 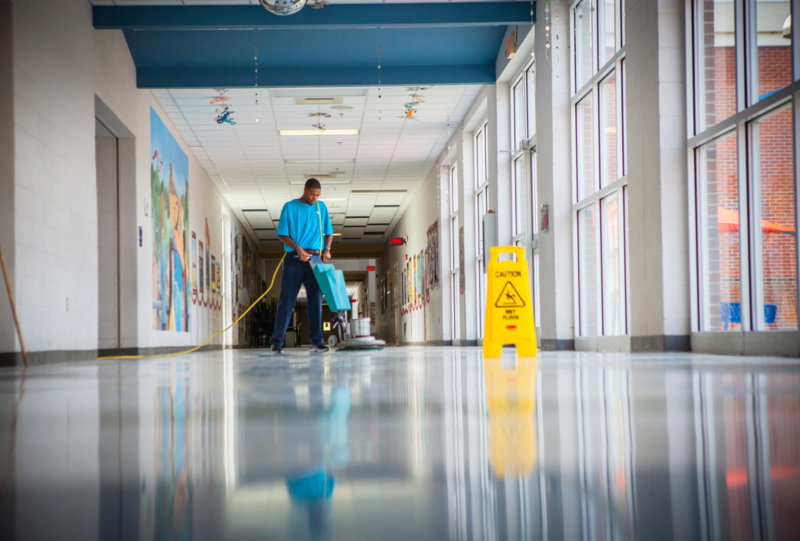 For end users, partnering with a commercial flooring contractor instead of a janitorial service also offers a number of advantages. With long-standing relationships with flooring product manufacturers, flooring contractors are much more likely to follow the specific manufacturer’s specifications for cleaning and maintenance, resulting in better flooring performance. A janitorial service will also have various cleaning responsibilities, while a flooring contractor will be dedicated to quality floorcare because of their technical expertise in flooring. “Commercial flooring contractors are dedicated to following the manufacturer’s guidelines of utilising quality equipment and chemistry, along with using technicians who follow the manufacturer’s specified processes,” says Eric. Eric has a few tips and advice for flooring contractors who are looking to cross the hurdle of establishing their commercial floorcare business. He advises contractors to first identify a go-to floorcare division manager who will represent their company well and run the division as if it is their own business. “The manager needs to be customer-focused and willing to hustle to grow the business. Once you’re well established with basic cleaning services, take a leap of faith into more technical work, such as the application of high performance coatings; grout colouring, which is refurbishment of grout through a deep clean, recolouring and coating process; or investment in specialty pads for a standard swing machine or buffer that can be used to polish marble, terrazzo and concrete. These provide a good inroad with customers and drive good revenue volume,” says Eric. By months 10 to 12, a contractor is likely to break even, with years two and beyond being profitable. “Revenue will double in the first three to four years, and reasonable profits will be realised in year three and beyond. This, of course, is dependent on the quality of the division leader and the support of the ownership and sales team,” adds Eric. According to Eric, it takes a few years for flooring contractors to feel a noticeable impact on their product installation revenue side from the maintenance business, but entering the maintenance business does eventually help contractors grow their traditional business. He says one difference between hard and soft surface cleaning routines that flooring contractors should keep in mind is that hard surface has a higher cost for daily maintenance versus carpet. “Carpet is engineered to hide debris and stains through pattern, colour, texture and fibre type, while hard surface has zero to minimal texture and isn’t able to hide debris. This results in a higher cleaning frequency for hard surfaces in the form of daily dust and debris removal,” says Eric. There are multiple people involved in the end user’s decision on which cleaning firm to use, including individuals in the facilities, procurement and finance departments. “That being said, a floorcare contractor will typically start a conversation with the facilities team. The best timing for change is when a new floor is installed, and there are two approaches to doing this. If the floorcare contractor is working directly with the end-use customer, it’s good to talk about floorcare offerings on the front end, even at specification. If a general contractor is involved, the flooring contractor might not have a chance until the walk-through or when they are sharing information on installation warranties,” concludes Eric. Full thanks and acknowledgement are given to www.floordaily.net and www.goscor.co.za for some of the information in this article.